Find exceptional service and repair for all of your heating, cooling, and appliance repair needs with the experienced team at Comfort King. Whether you are in need of maintenance services for your heating or air conditioning system, we can help you. We provide a FREE estimate for system installation, contact us today! Have a worry-free, warm winter. Keeping you cool when the temperatures rise. 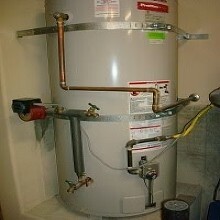 Solving your water heater issues. You shouldn’t have to layer on the clothes to stay warm when the temperature drops. 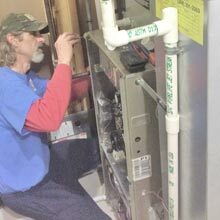 If your heater is giving you trouble, call Comfort King Mechanical, Inc. for complete repair services. Custom HVAC designs and installations will provide you with a reliable system that has been built just for you. We register manufacturers’ warranties so you are covered by the manufacturers whenever you need repairs down the road. Trust an innovative HVAC company that uses the latest technology for your next HVAC installation. Don’t sweat out another summer with a subpar (or non-existent) air conditioning system. From installation to repair, Comfort King Mechanical, Inc. is here for your air conditioning needs. From installation to repair, we do it all! 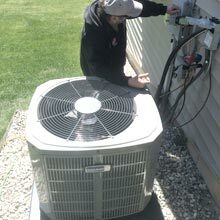 Your air conditioning system will run properly with the experienced, affordable, and professional service from Comfort King Mechanical, Inc.
We stock a large selection of parts so any repairs can be completed in a timely manner, keeping your home or business cool throughout the summer months. Hot water can often be taken for granted, but if your water heater isn’t functioning properly, then you might have to deal with lukewarm temperatures. Get the best repair and installation service from us. Your water heater is typically one of the most frequently used appliances in your home, and it can account for a lot in the total yearly energy costs. Choosing the right water heater is important. Comfort King Mechanical, Inc. installs and repairs water heaters the right way the first time, saving you time and money. A summer gathering or a holiday party is no time for your appliances to fail. Ensure your home’s appliances are working in peak condition with repair from Comfort King Mechanical, Inc. Benefit from our experience and know-how to repair your home’s appliances the right way the first time, saving you time and money. 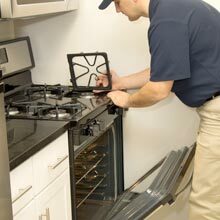 We will thoroughly check any appliance issue, answer any questions you may have about the repair, and offer affordable repair or replacement options.